Neil deGrasse Tyson is set to host a brand new late-night talk show on National Geographic this April. According to The Wrap, this brand new series will be named Star Talk and be very similar in nature to Tyson’s currently running Internet podcast of the same name. Like the StarTalk Radio podcast, the late-night show will have Tyson talking with scientists, celebrities, comedians, and other pop culture familiars as he bridges the gap between science and mainstream media. Tyson also recently starred in the 13-episode Cosmos mini-series documentary that explored the universe in unique and interesting ways. Cosmos featured the type of blunt science-based discussions and knowledge that will surely carry over into Star Talk. When Cosmos debuted in May of 2014, it did so first on Fox, and then on Nat Geo where it was “one of the most watched series in [Nat Geo] history,” according to CEO Courteney Monroe. Nothing about the show is set in stone as of yet, but Tyson did say he has plans to give Bill Nye space for a minute-long rant during every episode, similar (as The Hollywood Reporter noted) to Andy Rooney’s role on 60 Minutes for many years. 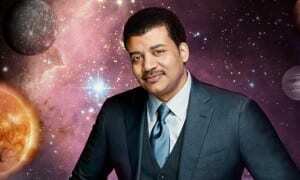 Whether it be on his radio show, in Cosmos, in public speechs, or even on Twitter, Neil deGrasse Tyson has never shied away from his intense dedication to science and finding the real truth in the universe. While he normally does it under the radar enough to not cause too much controversy, he did manage to kick up a storm on Twitter over the holidays with a tweet celebrating Isaac Newton’s birthday on December 25th. Star Talk will be filmed in front of a live studio audience from the American Museum of Natural History’s Hayden Planetarium in New York City. If all goes according to plan, the late-night show will debut on Nat Geo in April appropriately enough alongside the one-hour special Hubble’s Cosmic Journey.